Pure Enrichment Ultrasonic Cool Mist Humidifier is one of those machines that you must have in your baby room. And this is not only because it comes from one of the most trusted names in the industry but also because it will humidify your air in a matter of minutes. 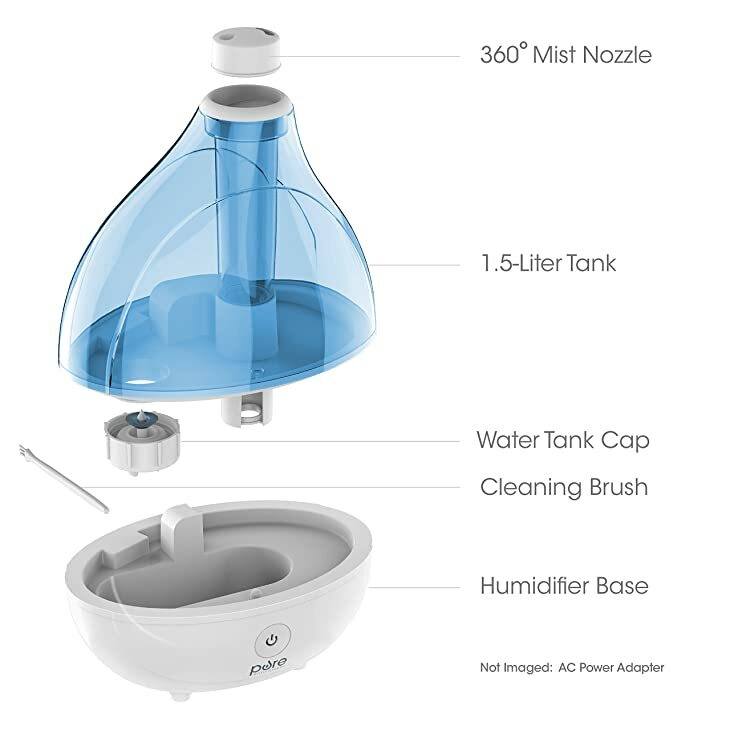 It is a lightweight and aesthetically appealing tabletop humidifier that uses ultrasonic technology to make your baby room as comfortable as possible. The machine has a 360-degree rotating nozzle that makes it easy to focus the mist where you like and a large 1. 5 liters tank for extended operation. Apart from this it also has a night light and an auto shut-off function for safety. Technology: This machine uses ultrasonic cool mist technology to provide your baby with safe and humidified air for up to 16 hours continuously. Night Light: Comes with an optional night light that will give you a soothing glow for maximum relaxation and also enable you to see at night without having to turn on the light. Auto Shut-Off: When the water level is low the humidifier with shut off automatically and hence preventing damages to the plastic casing and other accidents. 360-Degree Nozzle: You can be able to direct the mist in any direction that you wish, and this is thanks to the nozzles capability to turn a complete 360 degrees. 1.5 Liter Tank: The large tank will provide you with ideal coverage for small and medium size rooms. It also gives the machine the capability to operate for up to 16 hours without refilling. Easy to use and has many health benefits such as helping you prevent of colds and flu. Its simplicity and minimal maintenance requirement make it perfect for first-time users. This humidifier is a silent machine, and so it will not disturb your sleep. The night light will help you see at night without switching the lights on, and the soothing glow will also offer you maximum relaxation. Comes with a large tank that will make it run for many hours without refilling. The auto shut-off feature makes it safe and also helps to prevent accidents. Although the lightweight may be an advantage, it is also a shortcoming since you can easily knock it over. Mineral build up makes it difficult to clean. The cap on the tank is very tight, and this makes it difficult to remove. Its bright power light is not okay for people that like to sleep in total darkness. Pure Enrichment has been making humidifiers for many years and so you can be certain they know what people want to have at baby room. This lightweight ultrasonic cool mist humidifier proves this as it has everything that you can ever wish for in this type of machine. It has a large tank that will take you for several hours of continuous operation, and it is also very safe due to the auto shut off operation. Apart from this, it also has many other advantages such affordability and quiet operation. 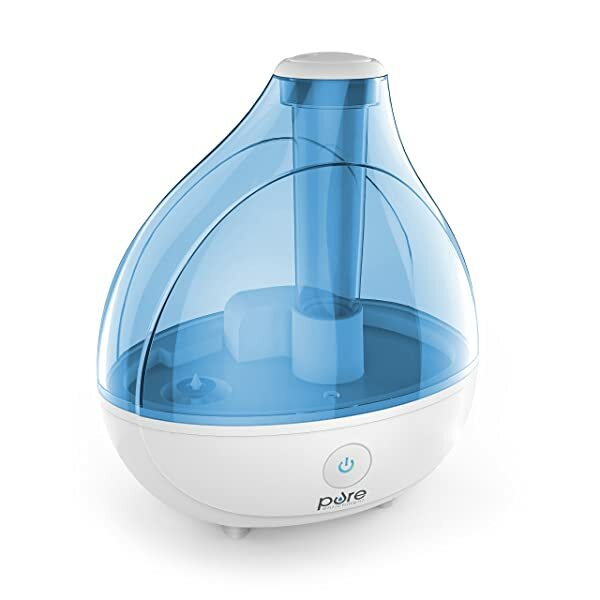 However, it also has a few demerits that you can overcome, and this makes it a best humidifier for baby to have at home, office and any other small room.